How To Get From Bangkok To Koh Chang? By land, sea and air. What is the best way to get from Bangkok to Koh Chang? There isn’t one mode of transport which is best for everyone. The best for you depends on your budget and preference for bus, minibus, private transfer or plane. Here is a brief rundown of the options for taking minibuses, buses, planes, boats and cars to Koh Chang. a) Will be clutching 800+ pages of Lonely Planet / Rough Guide guidebrick when you arrive in Thailand and will have spent plenty of time sitting in airport lounges memorising large tracts of it in order to avoid looking like an obvious tourist and wandering around wide eyed and gawping as soon as you arrive in Thailand. Having your head permanently bowed and buried in a well bookmarked guide doesn’t mark you out as a worldly wise traveller. It marks you out as someone likely to want to load up on cheap gems at a top secret government sale, that’s only on today, but fortunately is open to lucky folks like YOU! b) Possess enough wisdom, as an independent, worldly wise traveller, to be able to buy a ticket for the transportation of your choice from a tour agent. If not then a couple of words of Thai and a bit of sign language will get you sorted. Hand over the requested amount of Baht & don’t forget your “Kop khun ka/krap” on the way out. All you then have to do is to find your way to the pick up point or bus station without being taken on the 2 hour scenic route by a friendly tuk-tuk driver. Trat Airport opened in April 2003. There are daily flights from Bangkok for those who are horrified by the prospect of a 5 hour bus ride. The Trat office of Bangkok Airways can be reached on 039 525 299-30. But you’ll find it far easier and cheaper to book tickets online via www.bangkokair.com. Don’t expect much change from 8,000 Baht for a return trip during High Season. It’s cheaper to fly to Singapore or Hong Kong return than to Trat. There are now four flights per day. But be sure to reconfirm your flight the day before as flights do get cancelled especially in Low Season as they are rarely full, or even half full, this applies more to the early morning PG302 from Trat to Bangkok which means being picked up at 6.30am or earlier which isn’t an ideal time for many people. In Dec 2010 Bangkok Airways began operating new services between Trat and Samui ( and on to Phuket ). The flights weren’t cheap but did make sense if you were doing a two centre holiday and didn’t want to either waste a day travelling or spend the night in Bangkok. You’ll notice the use of the past tense in that last sentence – as not enough people were doing a two centre holiday and so the flights stopped operating in 2012. Not really surprising as the type of person who likes Phuket or Samui isn’t the type of person who usually likes the sleepier Koh Chang. From Trat Airport you’ll also need transport to your hotel on Koh Chang. If you don’t want to pay rather a lot for your hotel to pick you up privately a shared minibus service which can be booked in advance operates from the airport to all Koh Chang hotels. The price is currently 500 Baht/person including ferry ticket. In an ideal world cheap taxis would be hanging around the airport waiting to take people to their hotels – but there aren’t. You can try walking to the main road and flagging down a local pick up truck taxi to take you to the ferry pier – but that isn’t a fun way to start your holiday. And if you were planning to save money, you wouldn’t have flown in the first place. Save money and book tickets for the shared minibus between Trat Airport and hotels on Koh Chang. How long does it take to get to Koh Chang? The times below are based on driving yourself or using a private transfer service. expect buses and minibuses to be slower. They won’t always take the most direct route and will stop numerous times during the journey. The times below are to the mainland pier. Ferries depart about every 45 minutes or more frequently at busy times of year. When you reach Koh Chang you will have from 5 minutes to an hour drive depending on where you are staying. Getting to Koh Chang by self-drive is easier than you might imagine. It’s a straightforward drive. Companies such as Hertz or Budget Car Hire will provide a GPS in English which makes life much easier. But the majority of road signs are in English and Thai, so driving is pretty simple in Thailand. How to drive from Bangkok to Koh Chang. Follow the Bangna-Trat road or motorway (Highway 7) out of Bangkok until you see Highway 344. Stay on the 344, looking out for police checkpoints as they like to stop drivers for no reason on this stretch of road. Join Highway 3 again near Klaeng and then, about 23km before Trat, turn left at the T-junction with 3156, signposted to Laem Ngop. 25 mins later you’ll be at the first of the ferry piers – ‘Ferry Koh Chang’, known as Ao Thammachat to most Thais. This is the better of the two car ferry companies, with a shorter crossing time and sailings every 45 minutes from 0700 – 1900 daily. To reach the other ferry, Centerpoint, head about 5km east of Ferry Koh Chang. Crossing time is about 45 mins to an hour & ticket prices are just about the same. Centrepoint’s last ferry is at 1930. See this Google Map for the best route from Bangkok to Koh Chang by car. You may have thought that getting five gap year students with backpacks the size of ATM machines; 3 full figured Swedish chicks; a honeymooning English couple reliving their travelling days and now regretting it; a muscle bound middle aged German and a bewildered Chinese couple loaded down with camera gear plus two Thai blokes, who appear to be mates of the driver, into the back of an 1995 model Toyota Hiace minivan was a physical impossibility. It isn’t, as you’ll discover if you make the trip from Khao San Road to Koh Chang using this form of authentic Thai transport. Figure on 600 – 750 Baht for the clapped out minibus experience. 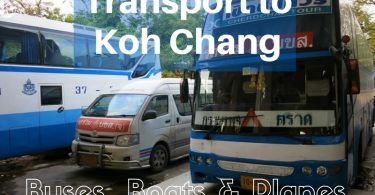 Getting to Koh Chang by full size bus from Ekkamai bus terminal in Bangkok might not be as convenient, but it means you’ll still have some circulation in you legs when you eventually arrive at the ferry pier. The bus you want to take is the 999 run by the government ‘Transport Co. Ltd’. There are two departures at 07:45 and 09:00 which will drop you off at one of the ferry piers. These buses also make a stop at Suvaranbhumi Airport Transportation terminal around 08:20 and 09:45. The buses are modern and you’ll also get served a free snack onboard. They’ll stop once on the way for a 15 minute break. If you’re on the earlier bus you should reach Ao Thammachat pier around 13:30. The later bus drops people off at Centrepoint at around 15:00. You can also use this bus to get to Krom Luang pier, Laem Ngop to take a speedboat to Koh Mak. But be sure to tell the staff when you buy your ticket that you want to be dropped off there and not in Laem Ngop village , about 1Km away. There are also public minibuses from both Ekkamai bus station and Morchit bus station to Laem Ngop or Trat. But if you want to get to Koh Chang the same day, be sure to be on a minibus by 13:00. The ticket price is 300 Baht/person. If you take a minibus heading to Trat, passengers heading to Koh Chang will be dropped off at a village called Saen Tung, about 20Km before Trat. From here you’ll be put on a songtaew ( pick up truck taxi ) to the ferry pier. It’s around 25 minutes drive to the pier. Ticket price is around 130 Baht including ferry ticket – which is a good deal. The ferry ticket is 80 Baht one way. Coming back from Koh Chang to Bangkok, minibuses depart from the mainland pier at Ao Thammachat every hour or so. Buy tickets before you get on the ferry. You can’t miss the ticket office with huge sign. These minibus services also run to Pattaya and Rayong. 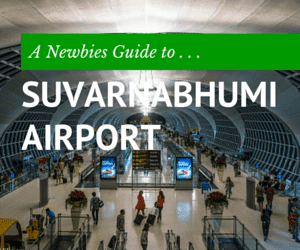 If you are flying into Suvarnabhumi Airport, a bus and minibus service from the terminal building to hotels on Koh Chang began running in 2010. When you land go to Entrance 8 on the Ground Floor on the main terminal building. There you will find the Suvarnabhumi Burupha Bus counter. Buy tickets there. Ticket price is 600 Baht one way, including ferry ticket and 1,050 Baht return. There are services at 07:50, 11:00, 14:00. A big bus is usually used for the 07:50 service, microbuses or minibuses are used for the other services. These tickets can only be booked online through the 12go.asia website. Nowadays more people are now flying into Bangkok’s second airport, Don Meuang which is used by budget carriers, however there aren’t any direct transport links to Koh Chang or Trat from that airport. You’ll need to take a shuttle bus from the Arrivals level to either Morchit Bus Station or Ekkamai Bus Station. From there you can take a bus or minibus to Trat. An alternative is to take a taxi to Suvarnabhumi Airport and then take the minibus to your hotel on Koh Chang. There are also several daily minibus services making the trip from Pattaya to Koh Chang. Buy tickets from any tour agent or your hotel in Pattaya for around 700 – 900 Baht depending on the company and if you want dropping off at the mainland pier or your hotel on Koh Chang. They tend to pick up from hotels in Pattaya early – around 7am. It is possible to do the trip by public bus. But it’s slow and a hassle as you have to change buses a couple of times on the way. So I’d recommend taking a minibus unless you want to spend the entire day travelling. Can I take a taxi from Bangkok to Koh Chang? Yes. It is possible to flag down a taxi in central Bangkok or hop in a taxi at Bangkok Airport and go to one of the mainland ferry piers for Koh Chang. Note that it will require some negotiations with the taxi driver and the cost will depend on both your haggling skills and how desperate the driver is to spend the next 10 -12 hours on a round trip. With a bit of luck you’ll be quoted around 3,500 Baht, if you look wealthy or desperate expect the price to be nearer 4,000 or more. It’s worth bearing in mind that most Bangkok taxi drivers wont have ever driven to Trat before so you’ll have to have an idea of which direction you should be going in. The taxis also usually won’t go onto the island, they’ll drop you off at the pier and then head back to Bangkok. So you’ll still have to buy ferry tickets and then hop on a crowded songtaew (pick up truck taxi) to your resort. So, it’s probably best to leave getting to Koh Chang by public taxi to people who have travelled in Thailand before and know what to expect from the average taxi driver. Why take a Private Transfer by car or minibus? Maybe you want to see a bit of Thai countryside after a long flight. Maybe you don’t enjoy jumping on and off public transport with suitcases and children. Maybe the cost of flying a family or a group is prohibitive. Whatever the reason, more people are now booking private transfers between Bangkok and Koh Chang. The cost for a van that will comfortable accommodate up to 8 people and their luggage is from 5,100 – 5,500 Baht for a one way transfer, less for couples. Since 2005 I have partnered with a reliable group of local drivers based on Koh Chang, in order to provide a private transfer service through this site. To date, several thousand couples, families and groups have used the service. I use drivers that I know provide a good, reliable service and won’t screw up advance bookings or fail to show up. No deposit or advance payment is required for transfers. How much does a private transfer cost? A private transfer for two people by Toyota Camry, Honda HRV or Toyota Altis will be 4,600 Baht total. This is from a hotel in Bangkok or Bangkok Airport to any hotel on Koh Chang. It includes tax, driver, gasoline, expressway tolls and ferry tickets. Or for a family of five, by Toyota Commuter minibus. 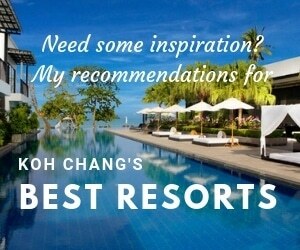 From a hotel in Bangkok or Bangkok Airport to any hotel on Koh Chang. The price will be 5,200 Baht – total. Here are full details of the transfer service. In the old days, pre-2007, there was a wooden boat service from Laem Ngop, a less than riveting mainland fishing village, where travellers caught an over-crowded passenger boat (a converted wooden trawler) to Koh Chang. These have stopped running. Everyone now uses the larger, safer, vehicle ferries. 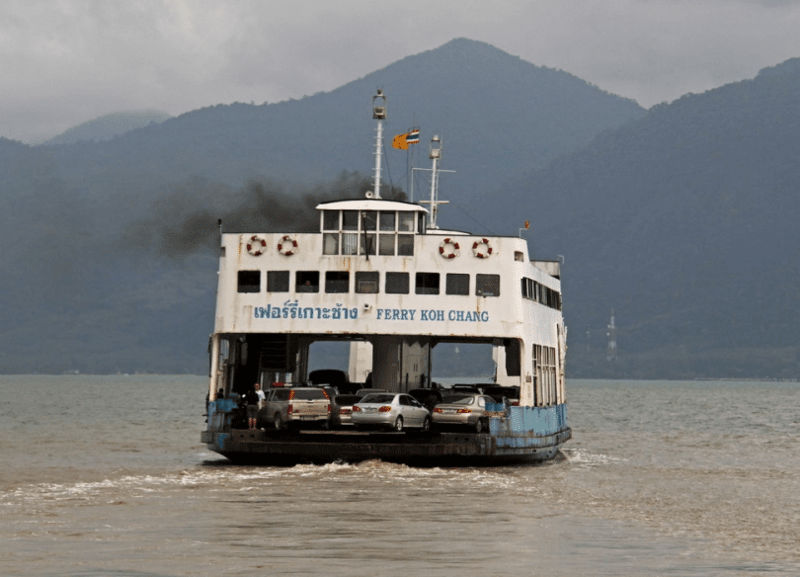 There are two car ferry companies running regular services to Koh Chang from piers on the mainland. These are ‘Ferry Koh Chang’ and ‘Centrepoint Ferry’ that run from piers about 5Km apart on the mainland. Ticket prices are the same, 80 Baht for Adults & kids over 10/11 years old & 30 Baht for Kids aged 7-10. Under 7 is free. Centrepoint sells return tickets for 140 Baht – however, Ferry Koh Chang is more convenient for most people and there are more buses & minibuses using this pier for trips back to Bangkok. So I wouldn’t bother buying a return ticket. Both run services from around 0630 – 1900. Although during High Season Centrepoint often runs later services over the weekends and Thai holidays. Several buses from Bangkok will stop at the piers and you can also catch a bus or minibus back to Bangkok from the mainland piers, rather than having to do a detour to Trat in order to get between Koh Chang & elsewhere.